What does the word fungi make you think of? For many, it conjures up images of athlete’s foot and mold, and not money in the bank. But mushroom cultivation can be a profitable and enjoyable endeavor for those willing to take the time and space to grow edible gourmet mushrooms on their property. Many Ithacans have recently discovered this agroforestry project and are diving in to the world of mushroom cultivation. Mushroom cultivation has been around for centuries, so the question remains: What is contributing to the recent mushroom craze in Ithaca? What has prompted this sudden fungal fever in upstate New York, an area that has been bursting with mushrooms long before humans inhabited it? Public education and demonstrations have played a big role, with organizations such as the Cornell Mushroom Collectors, Cultivators, and Connoisseurs Club demonstrating different methods of growing mushrooms to the people of Ithaca. The demonstrations are having a noticeable affect around town, sparking interest that before circulated only among a select group of mycological enthusiasts. Mudge was actually responsible for teaching Hobbs how to perfect the art of at-home mushroom cultivation, and he is an example of how the knowledge and interest is spreading around Ithaca. And that is how many local Ithacans are now getting interested. People like Mudge and Hobbs are working with mushroom-loving students to give demonstrations at places like the Farmer’s Market and MacDaniel’s Nut Grove Teaching Forest, helping people realize that they don’t have to buy expensive mushrooms from the store any more. They can use the basic knowledge they learn at demonstrations and materials from their own land such as leftover logs or wood chips to grow gourmet shiitake and oyster mushrooms on their own. A huge marketing industry has developed around this growing interest, and exponentially made the market bigger. Now you can get mushroom spawn, inoculum, instructions and a plethora of other mushroom growing supplies online and in catalogs. For example, the company Fungi Perfecti sells indoor and outdoor ready-to-grow mushroom kits, plug spawn, and any other material you could possibly need to start your own mushroom patch or log growth. A typical mushroom growing kit costs about 25 dollars, so anyone can really test the waters with one of these simple starter kits. Another reason that mushroom cultivation is becoming so popular in Ithaca is the availability of materials needed to start the project. Mushrooms can be grown on maple and oak logs that are injected with mushroom spores. All it takes is the spawn, logs, and some other basic materials, and you can have two pounds of mushrooms fruiting within a year. Many people in Ithaca have stands of trees in their backyards, and want a way to make extra money off of their timber supply. Instead of just using logs they have chopped for firewood, people are learning to grow mushrooms on the logs first to make a tasty treat and extra cash. “When you have land, you have waste products. Trees fall down. You also need to thin out the forest, so what do you do with the logs? Growing mushrooms seems to me a good use of that. It’s a sustainable way of managing the forest,” Hobbs said. The process of growing the mushrooms does take time; in fact it takes about a year from the time you start to see any mushrooms fruiting. First, you need mushroom spawn (mycelium) that has colonized some type of medium. The medium is usually sawdust or wood in some form. In the case of growing shiitake mushrooms on logs, one of the most popular and productive methods, you need small wooden dowels that have been inoculated with mushroom mycelium, which you can get from various suppliers, or for the more experienced mushroom grower, you can grow your own. 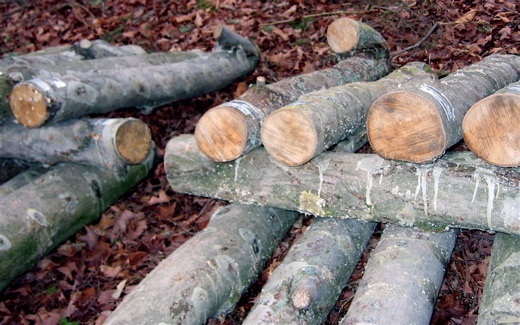 The logs you use should be freshly cut, about two weeks old at the most, so they have a sugar supply for the fungi. You can inoculate many or just a few logs at a time, depending on how much time and labor you can invest in the project. To prepare the logs, drill holes into the wood an inch deep, about six inches apart from each other. Hammer the shiitake-inoculated dowels into the holes. You then seal the holes by brushing on hot food-grade cheese wax to keep out competing fungi and retain moisture. The logs are now inoculated with fungi that will begin colonizing the wood. The logs must be kept moist for the fungi to stay alive. In about one year the mycelium will have fully colonized the log, and when you want the shiitake mushrooms to fruit, you soak the log in water for 24 hours to induce fruiting. Within one week, if all conditions are right, you will see mushrooms sprouting out of the holes where you hammered in the dowels. You can force-fruit each log twice per season, for five years. This is a good option for people who have some time and want to make some extra money from their timber supply. “On average over the five year period that the log lasts, we’re talking between 20 to 40 dollars per log, based on a selling price of 10-15 dollar a pound for the mushrooms. That’s opposed to the pennies you can make from using the log as firewood,” Mudge said. People are growing mushrooms for reasons besides profit as well. 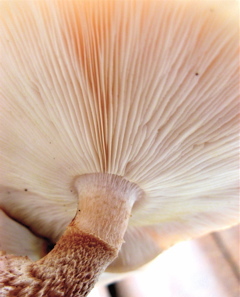 Many state plain self-satisfaction as a main factor in growing mushrooms. “I don’t grow them for financial gain, but I grow them because I get a certain amount of satisfaction from doing that and being successful. I’ll give away a log to a friend once in a while, so they can have that satisfaction when the mushrooms fruit. Then they usually get interested and want to start their own log project.” Hobbs said. Experienced mushroom growers like Hobbs and Mudge make it look easy to run a successful mushroom operation out of your backyard, but many factors can lead to the failure of a mushroom project. Contamination from other fungal species, the log drying out, and animals eating the inoculum are all possible and common sources of failure. And even the experts run into these problems. “There’s no guarantee that a person will succeed. In fact, more people try it and do not succeed than those who do succeed. That depends on the training. Learning about the need for long-term maintenance is what’s lacking. A lot of people don’t know that it takes commitment. It’s certainly a risk if you’ve invested money or time,” Mudge said. Risk of losing money on an investment and wasting the labor time are some main deterrents in starting a mushroom project, but those who have succeeded in growing gourmet mushrooms will confirm that the taste of a fresh shiitake from their own backyard is well worth the risk. We recommend getting started with a kit or some how-to books from Fungi Perfecti (WA) or Field and Forest Products (WI). Shiitake and oyster mushrooms are good bets for learning log cultivation. Seek further guidance from Cornell’s online resource, the How, When and Why of Forest Farming. The site includes a useful video featuring the late mushroom grower/guru John Boyle, plus tips and links to more info. See also Cornell’s New York Forest Mushroom Growers Network. The Cornell Mushroom Collectors, Cultivators, and Connoisseurs Club, founded in 2006, doesn’t have a web page, but if you are in the Ithaca area you can join their electronic mailing list by sending your email address and name to Kathie Hodge, your humble blogger and mailing list maintainer, who also cleverly took the images for this post. I love your topic. I’m learning right now about mycology. I’m doing it as part of a larger project to start my own permaculture setup. Anyhow, I love the blog! cornell has a good site! thanks but i believe ALL photos of mushrooms should have them identified by genus / species…c’mon now.